For over 100 years, visitors to Yellowstone have been fascinated by the large populations of big animals, such as elk, moose, buffalo, and bear. However, these beautiful animals represent only a tiny fraction of the significant biological resources of Yellowstone. The visitor might be surprised to learn that the living organisms in Yellowstone that have had the greatest economic impact on society are quite invisible. These are the microorganisms that live in the boiling waters and run-off channels of the geysers and hot springs. Although their color is visible to the naked eye, an individual microbial cell is so small as to be completely invisible. It is only because of their vast numbers that we know they are there. The microorganisms of the hot springs are mostly bacteria, but at the lower temperatures algae and protozoa are also present. Bacteria are so tiny that 500 of them could be placed end to end across the period at the end of this sentence. Only with a microscope can a single bacterial cell be seen. Although we often think of bacteria only as the causes of disease, most of the bacteria present in the world are completely harmless. 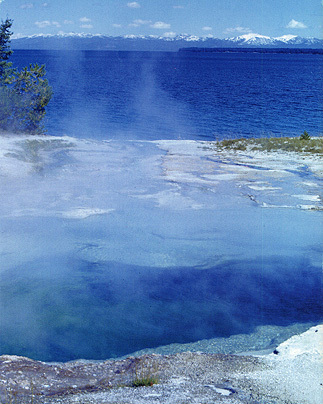 Many bacteria, including some from Yellowstone, are actually very helpful. Why are these tiny creatures of Yellowstone's hidden depths so important? Since they were discovered in the 1960s, they have been found to have major uses in the biotechnology industry. In recent years, Yellowstone has been a destination for researchers from biotechnology companies from across the world looking for new kinds of bacteria that can be exploited commercially. 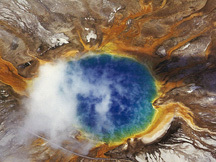 One type of bacterium first found in Yellowstone has served as the basis for a $300 million industry!